Pork sausages wrapped in smoked streaky bacon with added water. BBQ Seasoned pork sausages wrapped in smoked streaky bacon, these kebabs are great come rain or shine. 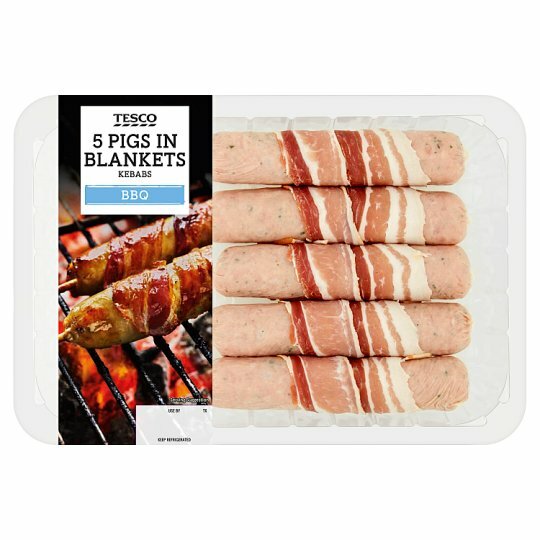 INGREDIENTS: Pork Sausage (86%) [Pork, Water, Wheat Flour (Wheat Flour, Calcium Carbonate, Iron, Niacin, Thiamin), Salt, Parsley, Dextrose (Sulphites), Raising Agent (Ammonium Bicarbonate), Stabilisers (Disodium Diphosphate, Tetrasodium Diphosphate), Yeast Extract (Sulphites), Preservative (Sodium Metabisulphite), White Pepper, Black Pepper, Antioxidant (Ascorbic Acid), Nutmeg Extract, Mace Extract], Smoked Streaky Bacon (13%) [Pork Belly, Water, Salt, Preservatives (Sodium Nitrite, Potassium Nitrate)]. Instructions: 200°C/Fan 180°C/Gas 6 Chilled: 25 mins Place on a baking tray in the centre of a pre-heated oven for 25 minutes. Turn half way through cooking. Instructions: For a chargrilled barbecue effect, cook as per cooking guidelines above, then place on the barbecue for a further 5 minutes, turning frequently. Warning: This product contains sharp wooden/metal skewers..